A new born baby swaddled in any wrap or blanket makes a good portrait, but Halloween themed portraits are particularly cute for any October baby. 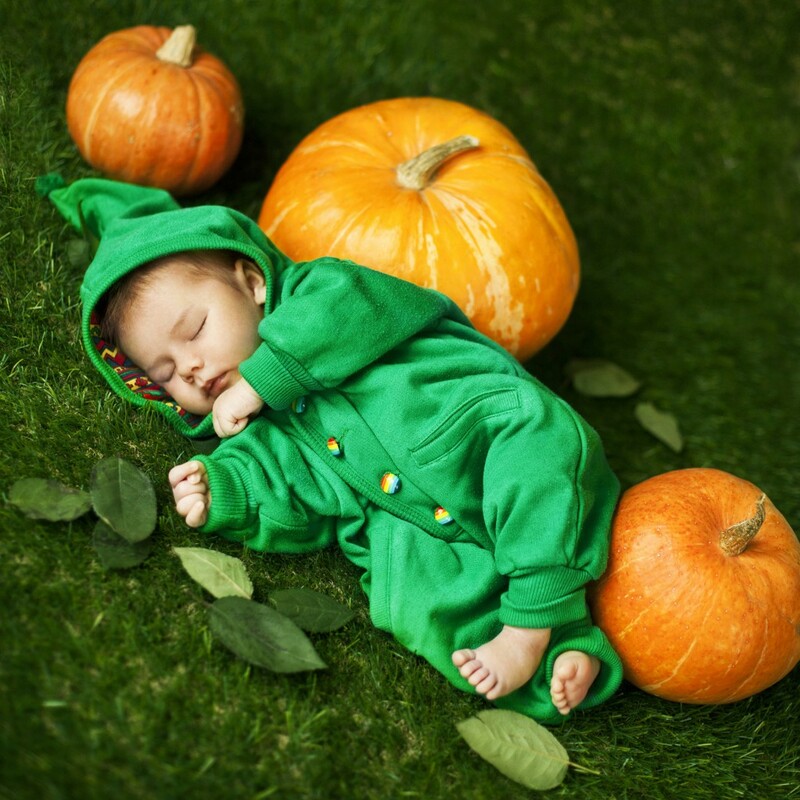 In your collection of baby props, it’s a good idea to have some Halloween outfits for baby, perhaps a knitted pumpkin for baby to sleep in. 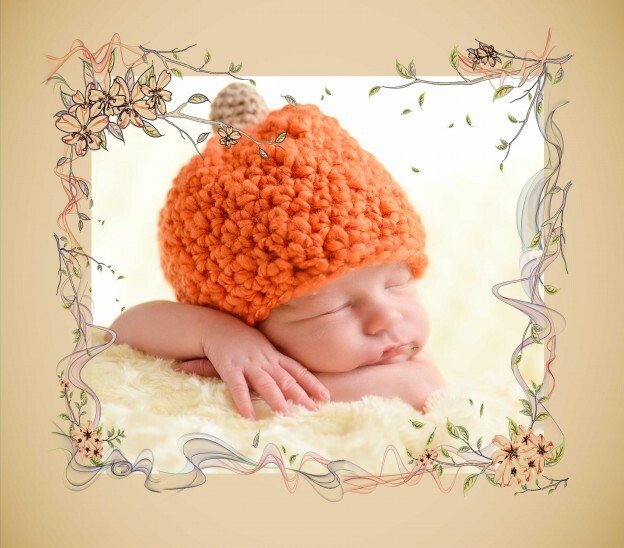 A pumpkin themed wrap works for any autumn baby portrait, and a wicker basket could be wrapped in different colors for any occasion or season. Neutral fabrics, and soft bean bags and blankets to curl the sleeping baby on will work for any season, and contrast with any color or outfit. They’re a great investment for your business. You can make or very easily purchase soft, knitted or crocheted blankets and wraps in a range of colors and textures. The simplest and softest fabrics and textures will give the most classic and timeless images. It’s important to keep the baby safe, and warm and comfortable at all times. When working with children of any age, it’s always a little unpredictable, but there are some ways to make sure that your baby portrait sessions run as smoothly as possible. It’s a good idea to ask that the baby has been fed and winded before the session, and then they’re at their most comfortable and most likely to fall asleep next. Don’t attempt to put the baby into any potentially dangerous or uncomfortable positions. Keep the parents around and on hand to help soothe the baby if they wake, or if you need an extra pair of hands to help position them. It’s normal to take several shots of the baby, and combine them in post processing. If you’re not comfortable with combining several different shots, then keep your poses simple and safe. Very little time and effort is needed to achieve beautiful baby portraits. With Smart Photo Editor you can quickly and easily add vignettes and borders to your image, turn your image Black + White, or Sepia, and insert your watermark for web-ready images. Try out Smart Photo Editor today. This entry was posted in Earning a living from photography, Holidays, How to and tagged Art and Photography, Baby Photography, Portrait editing software, Professional photographer on 2016-10-19 by Briony. 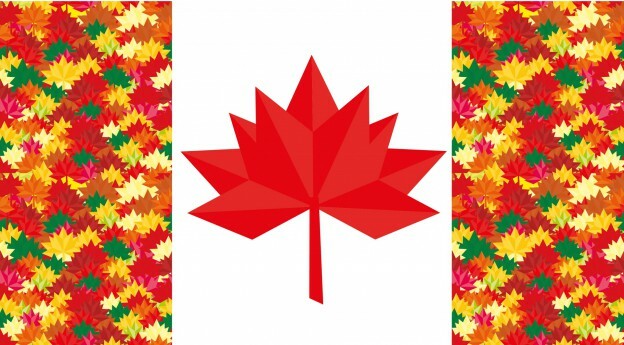 Today we’re wishing all our Canadian customers around the world a Happy Thanksgiving. We’re celebrating spending time with loved ones and cherished memories from previous years and being grateful for the good things that we have. It’s the perfect time to work on your personal photography, taking pictures of home and family and friends and being thankful for the time that we have to spend together. Happy Canadian Thanksgiving from all of us at Anthropics. This entry was posted in Holidays and tagged Family Portrait Photography, Portrait editing, Portrait Photography on 2016-10-10 by Briony.